Have you been on a Royal day trip? Do You know King Ludwig II of Bavaria? You would have to know his castle Neuschwanstein! King Ludwig II is the most famous royal of Bavaria, maybe even of all of Germany, for that matter. Ludwig II succeeded to the throne at the young age of 18 and he ruled Bavaria from 1864 to 1886. Ludwig had no real powers as King of Bavaria. Early in his reign Bavaria had become part of the larger Prussian state. Ludwig withdrew from many state affairs and the day to day running of Bavaria. By all accounts, Ludwig was a rather eccentric character. He was obsessed with castle’s, the arts and music by Richard Wagner. Ludwig spent all his royal coins and much more that he borrowed on building castles. In the end, this also lead to Ludwig”s downfall when his Government ministers had him declared insane. Ludwig died in 1886 in mysterious circumstances. 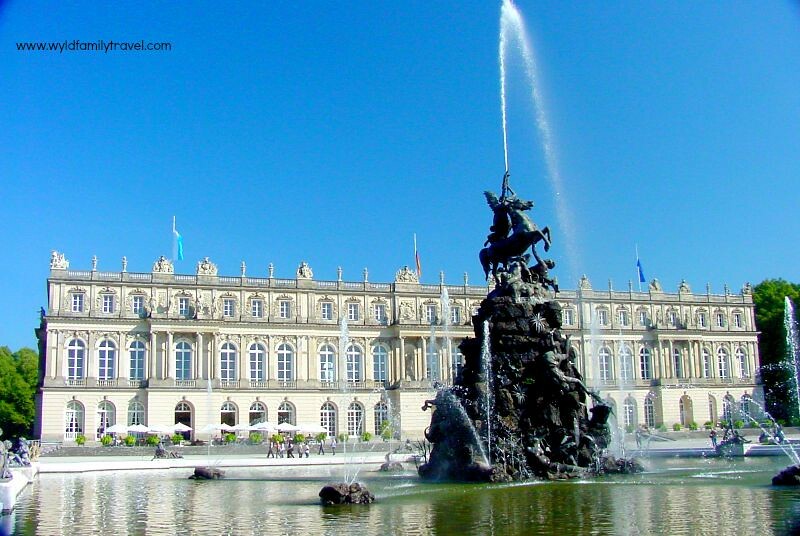 Today Ludwig”s extravagance leaves us Royal Castle’s that can be explored on royal day trips from Munich. His castles are some of the top things to see in Bavaria. We are going to look at 3 royal day trips to Linderhof, Herrenchiemsee, Hohenschwangau and Neuschwanstein. You might be thinking I said 3 yes I did. Luckily Neuschwanstein and Hohenschwangau are separated by only a road in the same village. 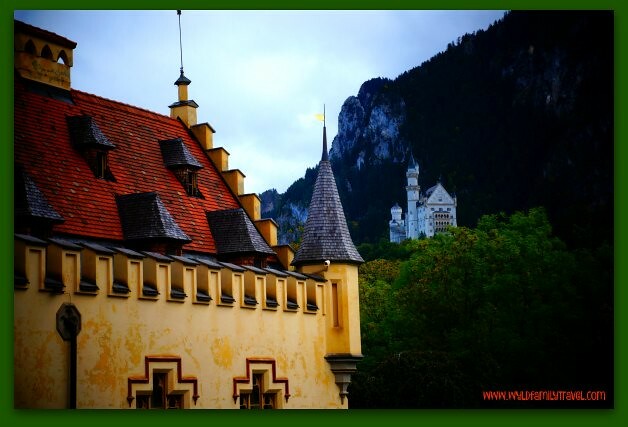 Many consider Neuschwanstein to be Ludwig”s masterpiece. It is certainly the most famous castle he created, if not the most famous castle in the world. Neuschwanstein sits on a rugged hill above the village of Hohenschwangau near Füssen in the south-west, Bavaria, Germany. Neuschwanstein was never finished as Ludwig had run out of money to complete it before his death. Ludwig had built Neuschwanstein as a personal refuge for himself. The castle was opened to the public straight after his death in 1886. Today over 1.4 million people visit the castle each year and in excess of 70 million have visited since its opening. 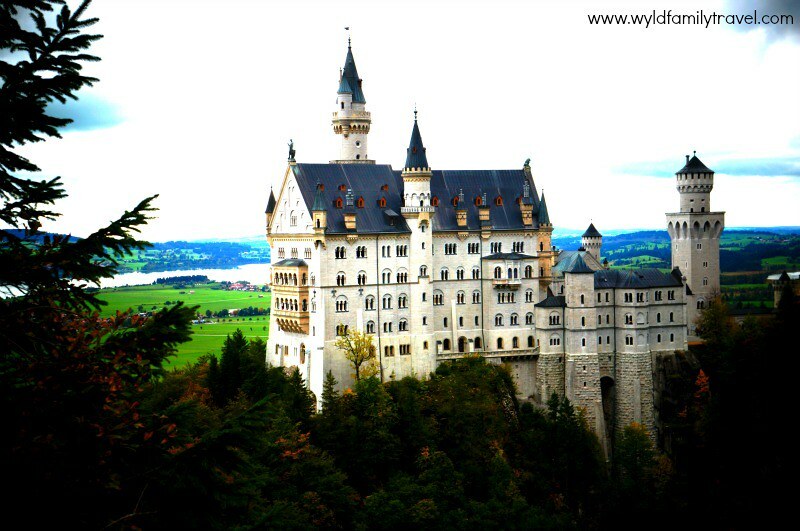 Walt Disney was inspired enough by Neuschwanstein to design the Snow White castle after Ludwig”s masterpiece. Neuschwanstein looms large as you approach filling your eye line as you get closer. Neuschwanstein can only be visited on a guided tour. 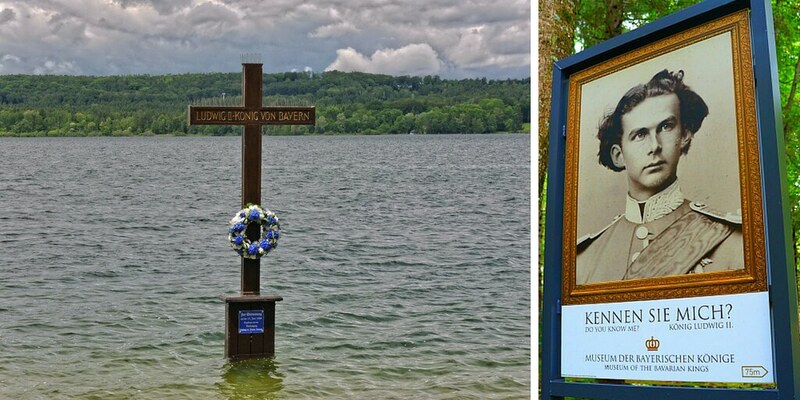 Hohenschwangau was Ludwig”s childhood home where he lived with his parents and brother. Hohenschwangau Castle was first mentioned in the 12th century as fortress Schwangau. A family of medieval knights was responsible for the construction of the Fortress. The castle can only be viewed on a guided tour. The exterior reminds me of some of the castle’s you would see in Spain and Portugal with its yellow whitewash colouring. The tour of Hohenschwangau takes you through some of the most lavish rooms in the castle. Included you will see King Maximillian and King Ludwig’s Bedroom. King Ludwig moved into his father bedroom upon his death. After the tour has ended you can take your time and walk down the hill between the two castles. I was really interesting as it had pictures of the Royals who had lived in the castle on information boards. We were able to stop and read about the royals and explain some of their lives and histories to the girls. Hohenschwangau may be the lesser known castle but in no way should sit in the shadow of Neuschwanstein. A Neuschwanstein Castle Day Trip from Munich by Train is a great option. Located 2 hours from Munich, the enchanting old-world town of Füssen lies in the foothills of the Alps, framed by one of the most breathtaking natural settings in the world. Towering far above the village, seemingly sculpted out of the very mountains that rise magnificently to the heavens, is a sight made from the stuff of dreams: the fabulous and ethereal Neuschwanstein Castle. It is the setting of these two castle’s that brings the magic as much as the castle’s themselves. The hills they sit on, the small valley you look up to them from, the tree’s the forest the small little village you climb to them from. Fairytale castle’s these two are for sure. Driving from Munich to Neuschwanstein Castle by Car: Take the A7 motorway (direction Ulm-Kempten-Füssen) until the end. From Füssen first follow the road B17 to Schwangau, one of the hidden gems in Europe then the signs to Hohenschwangau for the fairytale castle or take the A7 motorway until the exit Kempten and then the road B12 to Marktoberdorf. Follow the road B16 to Roßhaupten – OAL I to Buching – and then take the road B17 to Schwangau and Hohenschwangau. Family Travel Tip: Both Neuschwanstein Castle and Herrenchiemsee Palace offer horse and cart rides to to their entrance. We strongly recommend this at Neuschwanstein as the walk to the is up a steep pathed hill that will definitely cause your child to complain! King Ludwig was a huge admirer of The Louis XlV of France. Herrenchiemsee Palace was loosely based on The Palace of Versailles near Paris. Herrenchiemsee even has its own hall of Mirrors. In 1873, King Ludwig II of Bavaria acquired the Herreninsel as the location for his Royal Palace of Herrenchiemsee (New Palace). On the Herreninsel, the largest island in Bavaria’s largest lake, the Chiemsee, you will visit one of the most imposing sights in the whole of the state: the grandiose Herrenchiemsee Palace of King Ludwig II, the builder of Neuschwanstein. The palace was built in imitation of the Palace of Versailles built by France’s Louis XIV, whom Ludwig held in the highest esteem. For more information on a great day trip click HERE. Herrenchiemsee Palace like Neuschwanstein was never fully finished before Ludwig’s death. Ludwig died leaving 50 of 70 rooms unfinished. Herrenchiemsee, if finished, would have been a masterpiece and rightly taken its spot as King Ludwig’s finest castle. The highlights of the interior include the large State Rooms, the State Staircase, the State Bedroom and the Great Hall of Mirrors. The Hall of Mirrors was amazing and worth a visit to Herrenchiemsee just to view this room alone. The King’s own rooms were in the intimate Small Apartment. Herrenchiemsee was designed in the French rococo style built in the classic shape of a palace. It is set on a small island where a short walk or a horse cart ride through the forest brings in views of the Herrenchiemsee facade. The showcase gardens are filled with fountains, many are copies or in the direct style of the Fountains at Versailles in Paris. I found Herrenchiemsee to probably be my favourite of all of Ludwig’s Castles/Palaces in Bavaria I loved the setting with the Palace sitting on an island surrounded by the Alps. The garden and fountains outside the Palace are amazing and very reminiscent of Versailles. It’s regal, very regal this Palace. A lack of crowds was also welcome when compared to the masses that descend on Neuschwanstein. Tours are available of the palace. Take the train (www.bahn.com) to Prien am Chiemsee (around an hour’s ride from Munich). From Prien station, there is a special Chiemsee train to the Prien/Stock boat pier which runs during the summer season. The pier is otherwise about a 30-minute walk from the station. Take the A8 motorway (Salzburg-Munich), leaving at the Bernau exit to continue to Prien am Chiemsee. At the roundabout outside Prien follow the signs to Chiemsee or Königsschloss. From Prien/Stock, there are regular boats to the Herreninsel. Timetables of the Chiemsee train and the Chiemsee boats can be found on www.chiemsee-schifffahrt.de. Linderhof Palace was built by Ludwig on land owned by his father. His father had a small building already on the property called the foresters house (hunting lodge). Ludwig decided to build his new Palace Linderhof to replace the old forester’s house. The foresters house was used for Royal hunting trips. 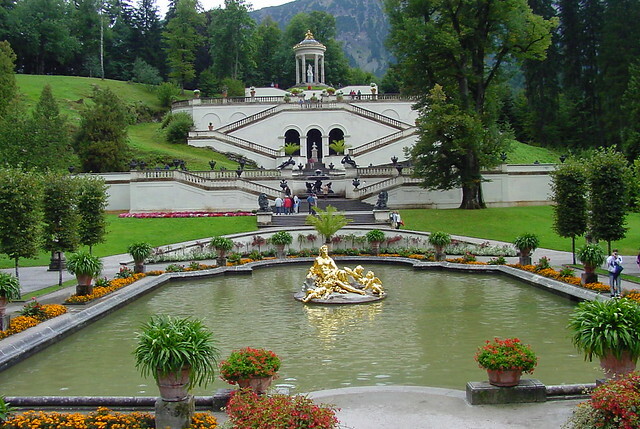 Linderhof was the only one of Ludwig’s building that was completed during his lifetime. Ludwig had an emotional attachment to the old hunting lodge. He had the lodge dismantled so he could build the Palace on its site and moved the lodge 200 metres away. The inside of the palace is adorned with painting and sculptures fit for a king. 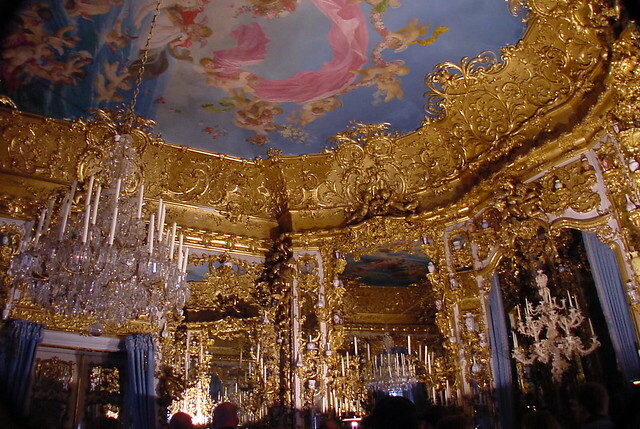 The lavish artwork is a feature of all 3 of these sights on the royal day trips. Go on a Linderhoff day trip from Munich. Depart from Munich and drive towards the German Alps into the Ettal. Stop off at Ettal Abbey, home to a community of about 50 monks. Explore the 14th-Century Abbey before continuing to the Royal Palace of Linderhof and Venus Grotto, 2 of the most precious jewels of Bavaria. 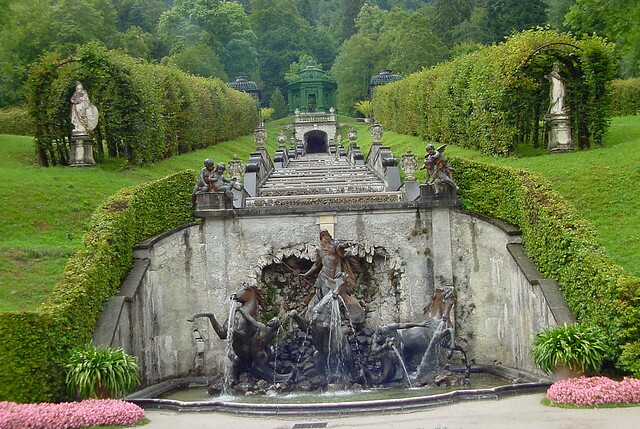 The gardens that were designed at Linderhof Palace are considered to be one of the most beautiful creations of historical garden design. The park combines elements of Italian Renaissance gardens with landscaped area’s that borrow inspiration from English gardens. It makes an amazing eclectic mix. Ludwig Trivia: Ludwig history says he was fascinated by trees. The story goes for this reason a tall, 300-year-old linden tree was allowed to remain in the formal gardens of Linderhof. Even though the tree does not sit with asthetics of the new garden. Historical pictures of King Ludwig exsit of him taking his breakfast, on a seat that is carved into the linden tree. Linderhof is the smallest of this Bavarian King’s royal buildings. For me, I remember Linderhof for its gold, gold color everywhere outside in the gardens and on the inside of the Palace itself. I remember the amazing gardens and the waterfall that cascaded down the hill from the hunting lodge to the Palace. Tours are available of the palace. Linderhof Palace is situated in the Graswang Valley, near the village of Ettal. As wintry road conditions are to be expected in the Linderhof area from October to April recommend winter equipment (snow tires, possibly snow chains) for your journey to Linderhof by car. Take the A95 motorway and the road B2 to Oberau. Follow the signs in Oberau to the road B23 (Ettaler Straße). Outside Ettal turn left to the road St2060. In Linderhof turn right to reach the palace. There are parking facilities for 550 cars and 20 coaches available (with costs). For the latest prices at Meininger, City Center click HERE. Take the train to Oberammergau: from Oberammergau, there is a bus connection to Linderhof. There are many other sites associated with the King. You can see his tomb in Munich and the Schloss Nymphenburg where Ludwigs family spent time when in the Bavarian capital of Munich. The royal day trips are well worth it for these amazing building to be seen. There would not be a traveller out there where Neuschwanstein wouldn’t be on their bucket list. Thank you, Ludwig, for all your eccentricity and the amazing legacy you have left in Bavaria for castle hunters like ourselves. We have made the royal road trips to see your amazing architecture and extravagance only a king could have. Munich is the second biggest city in Germany. Flughafen München Franz Josef Strauß is 28.5 kilometres from the city centre. By February of 2017 Flughafen München, Franz Josef Strauß features flights to 248 destinations, making it the airport with the fifth-most destinations worldwide. You can book an airport transfer with Suntransfers who we have personally used on many occasions. You can book a rental car with AutoEurope and have it waiting for you at Munich Airport. Munich has an extensive public transportation system. It consists of a network of underground (U-Bahn), suburban trains (S-Bahn), trams and buses. … Tickets can be purchased at the blue vending machines, found at U- and S-Bahn-stations, at many tram and bus stops and newspaper kiosks. There are different types of tickets: Single Tickets (called “Einzelfahrkarte”), Stripe Tickets (called “Streifenkarte”) and Day Tickets (called “Tageskarte”). Before first embarking, the ticket must be validated – insert the ticket into the small stamping machines posted at the entrances to U- and S-Bahn tracks or on trams and buses. It’s a € 60 fine if you are caught riding without a valid ticket. Another alternative for tourists is to buy a pass for the Munich Hop on hop off bus which takes you to all the sites in the city. Click here for further information and prices. Munich has accommodation options for every budget from Hostels, to apartments and hotels rooms. Hostels in Munich can start from as little as 20 euro’s a night for a shared dorm room. You can search Airbnb for their Munich accommodation offerings. If you have never used Airbnb before get yourself $50 credit by signing and booking a stay right HERE. Hotels in Melbourne generally start from around $100 a night for a double room and increase incrementally as the luxury rating rises towards 5 stars. Google states that 3-star averaging $144, 5-star averaging $469 for a night stay. We have been looking into a Europe trip with out little ones… the post has given us some more to think about! Munich has always intrigued us. Your photography is gorgeous! Your love of Bavaria shines through in these terrific photo’s and description. The fairytale palaces look magical and it is easy to forget the darker side of history in this country. You are making some wonderful memories for the children and the best way to learn is to see and experience the world. Wow great post and we love your pictures! Castle Neuschwanstein is still on our bucket list. Can’t wait to visit it after reading your post! Thanks for sharing. I was only 2 hours away from Munich back in 2009 but didn’t get a chance to visit. Herrenchiemsee Palace is mindblowing! We’re extremely lucky in Europe to have such wonderful architecture and castles. A writer after my own heart. I love castles, so no surprise i have been to Neuschwanstein! It was a part of my first european trip over 10 years ago (maybe more like 15…ahh!) The other two are moving to the top of the list!! Absolutely beautiful! Wow, these are fantastic ideas. I enjoyed reading the post but also the photos are stunning. Thanks for detailed information; definitely bookmarking this one. Looks like a must-visit place, thank you! As an Australian, I am fascinated by castles and chateaux. I do everything I can to visit them when I am in Europe. Have never heard of the Herrenchiemsee Palace, but it looks simply gorgeous. You mention that it reminds you of Versailles, and I can see that! I also think it reminds me a little of Buckingham Palace. I am simply in awe of the magnificent architecture and the beauty that is usually always inside. Great tips, thanks ! We missed Bavaria entirely on our last visit. Last year was one of the hottest summers on record in Germany, and our relatives, who live near Stuttgart, suggested that we come back in the off season for a castle tour. We left Neuschwanstein off of our list because we didn’t want to deal with the crowds, but I’d really love to visit Herrenchiemsee. What opulence! Great pictures! This makes me want to visit Germany even more! Maybe teaching English there is a good idea! I’ve been to Munich several times but never left the city. I love castles and will now make a point of trying to see one of these! Very interesting post! Have always loved to go to Palace around the world to understand the history. Neuschwanstein is indeed a great place to make a day trip from München, just make sure and get there early to avoid the bulk of the crowds! Wow!! Great information… lots of historic details. Most people just want to visit for the beauty of the castle and area. You’ve highlighted the history which really brings it to life. 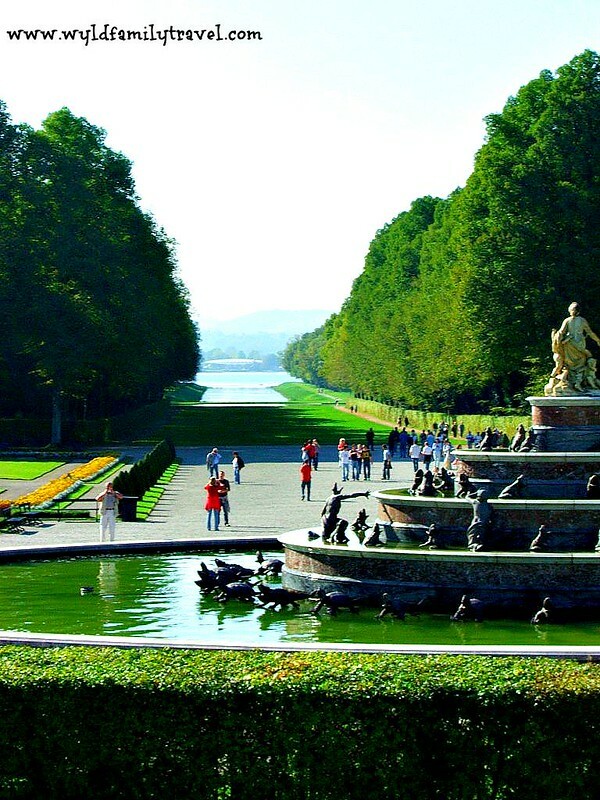 Herrenchiemsee Palace and Linderhof Palace are just stunning! Your pictures are beautiful, bet it was amazing being there in person to experience it all. Thank you for sharing such great info, I learned a lot and can’t wait to visit each one day. Thank you for this wonderful post! I would prefer to use the train to visit the Royal Castle. This is because I already see amazing scenery and I bet by train I would see some more beauty. I never had a royal trip before but this looks very interesting and worth visiting!